Welcome to the Timwood Homes website. Timwood Homes, LTD. opened for business on April 7, 1972. Timothy J. Mahoney, originally from Ireland, developed his building knowledge while employed with a shell builder. Loving the concept, Tim decided to venture out on his own. He sensed the need to share the value of shell building. While saving clients money and helping to be their own general contractors, Timwood Homes has vowed excellence in the importance of workmanship and materials. When you build with Timwood Homes you will receive supreme quality in both labor and materials. 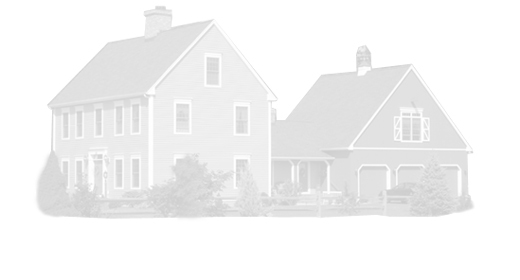 For over thirty years Timwood Homes has built hundreds of homes for countless satisfied customers primarily in Connecticut. No two homes have been built exactly alike. We have on many occasions built with some clients for a second time. We find it exceptionally rewarding. We are also taking pleasure in building for second generations. Darlene Ganley started to work with Tim in 1984. She started with being a secretary, which she enjoys as she loves to work with people. She has continuously advanced over the years into bookkeeping, accounting and even into sales. She is a one girl office. Her husband, Bill Ganley, is our primary framer. Bill has been framing with Timwood Homes since 1986. Bill loves his work and frames each house like they were his own. He often has suggestions to further customize each house. Darlene's mother, Lil, enjoys drawing custom sketches to help people realize their dream home. We maintain satisfaction in providing our clients with quality homes not just houses. We are dedicated to giving each client the personal attention they deserve. 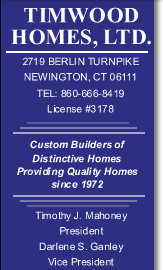 We truly enjoy building and are conveniently located in Newington on the Berlin Turnpike. Feel free to give us a call and stop by. 860-666-8419. We'd love to build for you.